Land Rover sold 686 examples of its Discovery in Canada from its first month of May 2017 to December of that year, increasing deliveries by 47.2 percent over the same seven months of 2016 when its mid-size seven-passenger challenger was the extremely well-proven yet still cult favoured LR4. Guilty as charged, I’m part of that LR4 cult. Yet, its once traditional SUV shape has now become a radically unconventional box, and therefore it’s made way for an entirely new, thoroughly modernized, sleeker, sportier, and yes, now more conventional luxury SUV that has truly won me over, the new fifth-generation Discovery so much more livable than its predecessor it became plain silly to stay loyal to the old beast. Driving a regular route from my home in Richmond, BC to Vancouver, and less often across the Lions Gate Bridge to the North Shore mountains, it looks as if 600 of those 686 Discoverys found their way here, but no doubt a good assortment have been snapped up in other premium SUV hotspots around Canada as well. 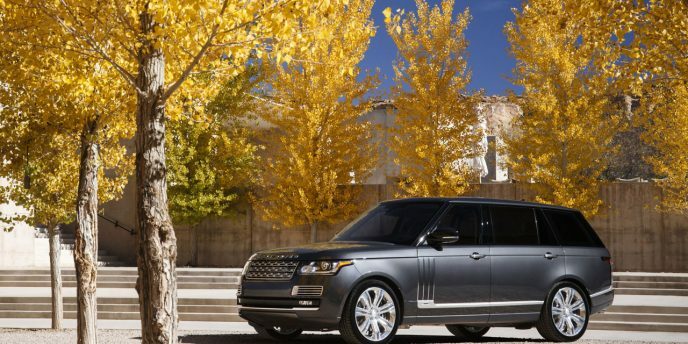 Either way the Discovery is gaining sales traction where the LR4 was losing ground, and that momentum should continue to pick up as more families realize this new kid on the luxury block is now available and that it’s well worth their attention. 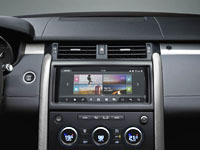 Despite only being in its second model year, the 2018 Discovery comes to market with some important updates to make sure such interested parties are as impressed as possible, starting with changes to its base SE trim that now gets a two-inch larger 10-inch infotainment touchscreen as standard equipment (don’t believe LR Canada’s website as it hasn’t been updated), a move that makes this display standard across the entire Discovery range. What’s more, autonomous emergency braking is standard too, while that base SE model now gets the optional advantage of Land Rover’s highly efficient Td6 six-cylinder turbocharged diesel. The standard SE model’s improvements have pushed its base price up from $61,500 last year to $63,900 today, a difference of $2,400, but I’m sure most will agree that improved infotainment and potentially lifesaving advanced safety are well worth the extra cost. Moving up through the range, both HSE and HSE Luxury trims can now be upgraded with Land Rover’s new second-generation head-up display system, which was much appreciated in my tester, as well as a 12.3-inch configurable TFT primary gauge cluster. Additionally, the British brand’s innovative Activity Key is available for adventurous owners who’d rather leave their key fob safely and securely in their SUV while wearing a waterproof digital bracelet with proximity-sensing keyless access capability around their wrist. My 2018 Discovery Td6 HSE Luxury tester came equipped with the more economical turbo-diesel, this engine’s very reasonable $2,000 increase making it financially justifiable due to fuel savings that should be recoupable over a few years of ownership. The numbers speak for themselves, with the alternative powerplant good for a claimed 11.2 L/100km in the city, 9.0 on the highway and 10.2 combined, compared to 14.7 city, 11.2 highway and 13.0 combined with the base gasoline-powered V6. Depending on how much you drive, the annual savings could be in the high hundreds. On that note both look downright stingy compared to the old LR4, which was soldiering along with a five-cycle Transport Canada rating of 16.2 city, 12.1 highway and 14.3 combined before its era came to a complete stop last year. Like with all diesel powerplants, high-speed thrust gets traded for low-speed twist, the base 3.0-litre supercharged V6 good for 340 horsepower and 332 lb-ft of torque compared to 254 horsepower and 443 lb-ft of torque for the 3.0-litre turbo-diesel, while both come mated to a ZF-sourced eight-speed automatic transmission that sends power down to all four wheels via Land Rover’s renowned Terrain Response off-road system. A noticeable difference between the two engines is off the line jump, with the gasoline-powered base engine putting more power down faster for a quicker 7.1-second sprint to 100km/h, and the turbo-diesel taking a full second longer to achieve the same result, at 8.1 seconds. Unless you’re always in a hurry or simply enjoy the occasional (or regular) adrenaline rush that comes when dashing away from stoplights this one-second discrepancy won’t be an issue, as both provide plenty of highway passing power and can cruise at speeds up to 209 km/h (130 mph). I happen to like the leisurely lope of a diesel and fully appreciate their savings at the pump, and I must say the Td6 performed flawlessly throughout my test, just like the 2017 Discovery Td6 I spent a week with last year. The two SUVs were optioned out similarly too, both in top-tier HSE Luxury trim, albeit this latest one finished in $870 Santorini Black instead of $870 Indus Silver, while improved with a few more upscale goodies as well. My previous tester was missing this 2018 model’s $1,740 optional 21-inch alloys that look superb and enhance lateral grip, while additional enhancements included some chrome edging on the otherwise body-colour door handles, a $2,350 Drive Pro package that builds upon the aforementioned standard Autonomous Emergency Braking system by adding Adaptive Cruise Control with Queue Assist, Blind Spot Monitor with Reverse Traffic Detection, Blind Spot Assist, Lane Keep Assist, a Driver Condition Monitor and Traffic Sign Recognition with an Adaptive Speed Limiter, the Drive Pro upgrade automatically necessitating the addition of $190 worth of auto-dimming side mirrors, which are always welcome during night driving. Additionally, my 2018 Discovery tester included a $2,040 optional rear seat entertainment system that features dual 8.0-inch monitors on the backsides of the front headrests, instead of last year’s left-side tablet holder and right-side coat hanger, plus a DVD changer, a really fancy looking remote, two WhiteFire digital headphones, and a secondary device interface on the backside of the front console (joining another one housed within that console) that gets fitted with two HDMI slots and two USB ports. This latest Disco also came with a power-folding seat system that’s capable of automatically lowering and/or raising individual sides of the 50/50-split third row as well as either the 60 or 40 percent portion of the second row, or both simultaneously, this standard on HSE Luxury trim. What’s more, you can also power all seats up and down via the infotainment system or a smartphone app. This is the best of such systems I’ve ever experienced, and as helpful as the obvious convenience this provides, it goes about its business quickly compared to other powered seat systems I’ve used. Right next to these buttons is switchgear for the powered liftgate and unique powered tailgate, the latter a beautifully finished carpeted shelf that folds down to provide a convenient place to load up to 300 kilograms (661 lbs) of heavier items on before sliding them inside the sizeable cargo hold, while it also stops items from falling out when opening the liftgate, important being that cargo has a habit of shifting during travel. And by the way, if upgraded to the available air suspension, which comes standard with HSE Luxury trim, you can lower the rear of the SUV via that panel of buttons to make the tailgate’s lift-over height a bit easier to deal with. Either way the Discovery provides 980 litres (34.6 cubic feet) of cargo space behind the third row, 1,231 litres (43.5 cubic feet) aft of the second row, and 2,500 litres (88.3 cubic feet) with both rear rows lowered. Both 2017 and 2018 models came with sumptuous Ebony (black) Windsor leather upholstery thanks to HSE Luxury trim, the more conventional choice from four total colourway options that include a Glacier (light grey) and Ebony split, a caramel coloured Vintage Tan and Ebony split, and a Nimbus (light beige) and Ebony combination, but take note this year’s Ebony interior adds a touch of class by including Nimbus piping, which matches the same coloured standard headliner (an Ebony headliner is $410 extra), while standard open-pore Natural Shadow Oak veneer warmed up both cabins. Inlay options include no-cost Dark Satin Brushed Aluminum and Natural Charcoal Oak, while High Gloss Charcoal Oak adds $620 to the bill. The 2018 model was devoid of side steps, making the reach up a bit more of a stretch, and didn’t come with the $310 optional 360-surround overhead parking aid, but its $1,940 7 Seat Luxury Climate Comfort package was a major bonus as it boasts 16-way power-adjustable front seats with massage, heated and cooled front and second-row outboard seats, heatable third row seats, and four-zone climate control with a comprehensive interface added to the backside of the front console. Some other features found on both SUVs included a $410 set of black roof rails, $140 for lane departure warning, and $110 for cabin air ionization, while this 2018 model included a $1,020 head-up display that projected speed, gear selection, and navigation directions onto the windshield, $410 for Advanced Tow Assist that literally backs the Discovery up to a trailer for you, which made the $670 Tow Equipment package prerequisite, upping trailering capacity to 3,720 kg (8,201 lbs), plus a $1,275 Capability Plus Package featuring All Terrain Progress Control (ATPC), Terrain Response 2, and an Active Rear Locking Differential. All of these extras increased the price of my tester to $93,360 before freight and fees, which is $29,460 more than the base Discovery yet starting to approach full-size Range Rover levels of features and functions for a fraction of that model’s $113,000 starting price. I bring up the big Range Rover because this new Discovery and that legendary luxury utility share the same underpinnings, as does the mid-size Range Rover Sport. This means the brand’s Integrated Body Frame (IBF) platform architecture has made way for an all-aluminum monocoque body shell and aluminum suspension design, allowing 480 kilos (1,058 lbs) less curb weight than the LR4. As you can likely imagine the new Discovery is not only more efficient than its predecessor, as noted earlier, but a great deal more enjoyable to drive. While the base SE comes standard with a fully independent coil-spring suspension setup and 19-inch alloys, my tester’s aforementioned 21s benefited from an air suspension upgrade that as mentioned comes standard with HSE Luxury trim. 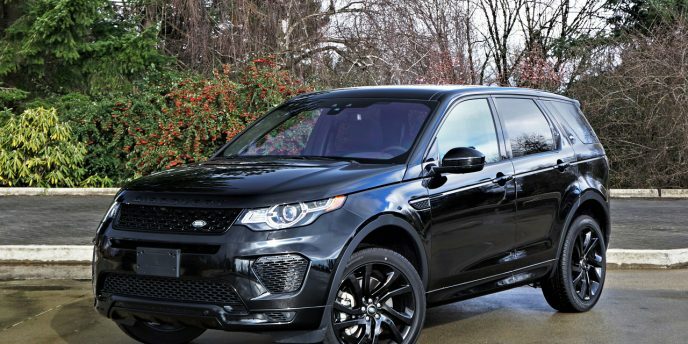 This made the most of the new Discovery’s lighter curb weight for an altogether more agile SUV, with sportier response during fast-paced curves that was especially noticeable when the weight shifted amid transitional corners. Of course, the Discovery remains a large SUV that’s never going to feel as athletic as something smaller like the Discovery Sport or Range Rover Evoque, but basing the new model on the same architecture as the amazingly capable Range Rover Sport has done wonders for the Disco, while it bodes well for a future SVR version of the latter. On that note I didn’t have opportunity to test the 2018 Discovery’s ability off pavement, but having driven other SUVs based on this architecture through mud, muck and over sand and rock I can only imagine it holds its own and then some. The Discovery includes the Land Rover brand’s legendary full-time four-wheel drive system featuring a locking centre differential and optional rear locking diff, which as mentioned was included with my loaner, while its driver selectable Terrain Response system makes choosing the ideal setup for a given road/trail condition ultimately easy. Basically, Terrain Response provides a rotating dial for selecting Normal, Grass/Gravel/Snow, Mud and Ruts, Sand, and Rock Crawl, while the upgraded Terrain Response 2 allows the vehicle to sense and adjust the driveline setup to best respond to changing conditions automatically. That’s my kind of off-roading. A compliant suspension is especially important when crawling over rocks and stumps, but it can be just as useful when trying to negotiate some of the back alleyways in my city. Whether blaming constant construction or sheer neglect, the Discovery’s air suspension made potholes and bumps less intrusive than they’d otherwise be, while good sound deadening and plenty of soft synthetic surfaces kept noise, vibration and harshness levels to a minimum. Still, a full-size Range Rover it’s not, which can be said of any SUV, as the priciest Landy would be my choice when it comes to full-on luxury. Considering the savings, however, the Discovery is finished very well, and once again better than its forebear. What’s more, the seats were sensational, and not just the aforementioned massage function. Easy to set up for my body size and shape as well as various preferences like squab height and angle, seatback angle and more, they were inherently comfortable, plus on top of this I was able to power-adjust the side bolsters to snuggly pinch my backside, and manually adjust the headrest via airline-style butterfly wings. The Discovery provides ample steering wheel reach as well, powered in HSE trims and above, so my long-legged, short-torso frame was able to fit in ideally for optimal comfort and control. All switchgear, which is very high in quality, was easy to reach, including the infotainment touchscreen, which I must say is an impressive high-resolution system with beautiful depth and contrast of colours, superb graphics and functions galore, one of my favourite features being the sonorous 14-speaker 825-watt Meridian audio system. Without getting granular, some HSE Luxury features not yet mentioned include that stereo, a heatable steering wheel, heated second-row seats, a standard third row for seven-passenger occupancy, extended stitched leather on the dash top and door uppers, interior mood lighting, chromed outer door handles, fog lamps, a high and low range two-speed transfer case, and more. Features pulled up from lesser trims include LED headlights with signature DLRs, 20-inch alloys, tri-zone auto climate control, in-dash storage behind the climate-controls (it actually powers open), satellite radio, front seat memory, the powered panoramic sliding moonroof (the base SE gets a fixed panoramic sunroof), hardwood inlays, front parking sensors, the powered inner tailgate and more from the HSE, plus proximity keyless access, pushbutton ignition, an electromechanical parking brake, power-folding heatable side mirrors with approach lights, rain-sensing wipers, a colour TFT multi-information display, an auto-dimming rearview mirror, rear parking sensors, a reverse camera, navigation, the InControl Remote phone app, Wi-Fi (for up to eight devices), a garage door opener, overhead sunglasses storage, a foot-activated powered gesture tailgate, hill descent control with off-road ABS, Hill Launch Assist, Gradient Acceleration Control (GAC), all the usual active and passive safety features, and more from the base SE. 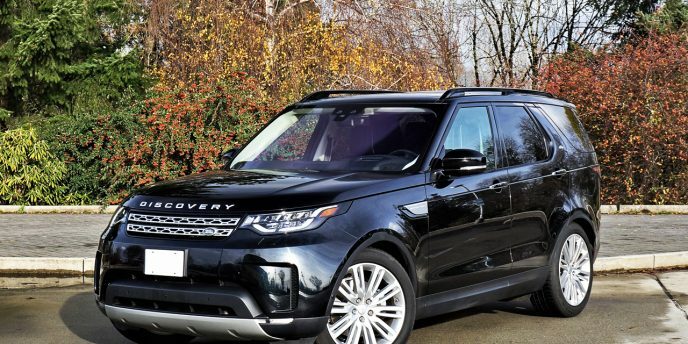 I haven’t mentioned half of what’s standard or available, but suffice to say the 2018 Land Rover Discovery provides even more value within its mid-size luxury segment than the 2017 version, combined with excellent build quality, two highly efficient yet formidable powertrains, much improved high-speed handling, unsurpassed off-road performance, confidence-inspiring standard and optional safety, and the list goes on. Being an adventurer at heart I find it very easy to recommend. The most noticeable additions include three new Jaguars, namely the XE compact sedan, F-Pace compact SUV, and all-new E-Pace subcompact SUV. Being that Land Rover is purely a sport utility brand and therefore won’t built cars (although the Evoque Convertible gets pretty close), its growth has come by adding namesake models in market segments previously held only by Range Rovers, and vice versa. A few years ago we saw the Land Rover Discovery Sport enter the compact SUV segment that only had the Range Rover Evoque prior to that, albeit half a size smaller, and now the new Range Rover Velar enters the same compact SUV segment, although it’s half a size larger. This, plus a completely reimagined mid-size Land Rover Discovery, has seen the brand’s Canadian sales grow by 78 percent since that aforementioned Discovery Sport arrived, whereas Jaguar has seen its numbers rise by 266 percent over the same period, for a collective 155 percent gain since 2014 began and 2017 ended. Compact? Yes the Velar, like the Jaguar F-Pace it shares chassis architectures and drivetrains with, is large enough that it borders on mid-size. It measures 4,803 millimetres (189.1 inches) in length with a 2,874-mm (113.1-inch) wheelbase, 1,665 mm (65.5 inches) tall and 2,145 mm (84.4 inches) wide with its mirrors extended, while its track spans 1,642 mm (64.6 inches) up front and 1,657 mm (65.2 inches) at the back. That makes it slightly longer and taller than the F-Pace, albeit a smidge narrower, with its wheelbase identical and track fractionally wider, yet it’s 76 mm (3.0 inches) shorter than the mid-size Range Rover Sport overall, with a 49-mm (1.9-inch) shorter wheelbase, 138-mm (5.4-inch) lower height, 75-mm (2.9-inch) narrower width, and 51/29-mm (2.0/1.1-inch) narrower front/rear track. I could go on comparing, but suffice to say the Velar is considerably larger than the Discovery Sport and much smaller than the mid-size Discovery, which itself is quite a bit larger than the Range Rover Sport. Compact it is. The $62,000 Velar also fills a dollar void in the Range Rover lineup between the $49,990 Evoque and the $78,800 Sport, albeit my Velar R-Dynamic HSE P380, at $82,600 before adding options, goes well past that base Range Rover Sport. Climb inside and you’ll quickly appreciate that nothing else in the compact luxury SUV segment comes even close. This is where I should probably point out that my R-Dynamic HSE came standard with a fully configurable driver display, which adds brilliantly bright high-resolution colour instrumentation to each side of a massive multi-info section, the latter looking fabulous when filled with the navigation system’s digital map. While impressive, the Velar has left every competitor behind including familial brands when it comes to centre stack displays. Yes, the word displays is plural for a reason, the Velar infused with the new InControl TouchPro Duo infotainment system. The topmost 10.2-inch widescreen monitor is amongst the industry’s best for clear, crisp quality and graphical stimulation, even canting towards the driver upon startup, but it’s the secondary display, integrated within the sloping console’s mid-section, that truly wows. Along with its inclusion of climate and seat controls plus plentiful vehicle settings such as the SUV’s Terrain Response system, it minimizes switchgear and thus cleans up the interior design, the result more Scandinavian than Volvo, and I mean that in a good way. There are knobs, two for the HVAC system and one for audio volume, but most everything else is under glass, so to speak, the fourth dial for gear selection in recent JLR tradition. Traditional for Range Rover, the quality of everything is beyond reproach. Go ahead and try to find any hard substandard plastics, you’ll come up short. Rather, much of the dash, instrument panel, centre stack/lower console sides, door panels, etcetera are covered in padded and stitched leathers, while the luxury sector’s usual soft-touch synthetics, brushed, patterned and bright metals, plus rich lacquered inlays are tastefully applied throughout, albeit higher grades of each than average. As usual for Range Rover the Velar also offers an abundance of colour, trim and finishing choices inside and out, this important for a product that’s as close to bespoke as the luxury segment gets. After all, personal expression is a key ingredient of top-tier luxury. So is getting comfortable, and the Velar offers a wide variety of front seat options to do so. Perforated grained leather is standard, although my tester came dressed up in softer Windsor hides with attractively patterned perforations, while the only sin of omission Range Rover makes with respect these otherwise inherently comfortable 10-way powered perches is a lack of front seat heaters in extreme base trim (which your dealer would never order). This is what happens when you get your playbook from the U.S., but to our advantage front seat memory is standard, while seat heaters are $510 options with rear warmers added for another $510 or, better yet, front cooling seats for just $310 more. Before getting bogged down in minutia I’ll leave the price of every upgrade, or for that matter the itemization of any such upgrades, to someone else, and rather focus in on the SUV at hand. As noted earlier, Land Rover provided my Velar tester in R-Dynamic HSE P380 trim, which from a comfort perspective (the HSE part) means that standard items found on the $62k base Velar S, such as 19-inch five-spoke alloys, colour multi-information display amid analogue gauges, grained leather, 10-way memory seats, 11-speaker Meridian audio, and more gets enhanced with 21-inch 10-spoke alloys (which once again were replaced on my tester), the 12.3-inch high-definition Interactive Driver Display noted earlier, the supple Windsor leather mentioned a moment ago, yet more comfortable 20-way front seats with the addition of standard heat and cooling functions plus (ahhh) massage, which was wonderfully relaxing, and six more side and rear speakers plus a dual channel subwoofer and Trifield technology for the Meridian audio system. Other items pulled up from base to HSE trim include LED headlights with signature DRLs and auto high beams, auto-dimming and power folding, heated side mirrors with approach lights, proximity access, pushbutton ignition, an electromechanical parking brake, rain-sensing wipers, an auto-dimming rearview mirror, a garage door opener, a sliding panoramic glass sunroof, voice activation, a rearview camera with dynamic guidelines, rear parking sensors, Navigation Pro GPS with brilliantly detailed mapping plus the ability to actually learn your regular routes and then update with traffic and ETA info as needed, Autonomous Emergency Braking (AEB), a powered gesture liftgate, and the list goes on and on. Some features found on the HSE that are optional with the base model include larger 350-mm front brakes, front parking sensors, a power-adjustable steering column, bright metal pedals, adaptive cruise control with queue assist and intelligent emergency braking, blindspot monitoring, lane departure warning, lane keeping assist, reverse traffic detection, driver condition monitoring, traffic sign recognition and adaptive speed limiter, and park assist. Thanks to dazzling Santorini Black paint, an R-Dynamic Black package, the aforementioned all-black wheels, chromed IP cap ends (yes, you can even dress it up where you can’t see when the doors are closed), configurable ambient interior lighting, a heatable steering wheel rim, heated rear seats, a head-up display, four-zone auto climate control with cabin air ionization and a cooled glove box, sensational sounding 23-speaker Meridian Signature 3D audio, a Convenience package with handy rear seat remote release levers, a cargo net, and a useful Activity Key wristband that lets you leave your keys in the car while engaging in activities that might put losing your keys at risk, an On/Off-Road package with upgraded Terrain Response 2, All Terrain Progress Control (ATPC) and Configurable Dynamics, and an Active Locking Rear Differential to enhance off-road capability, the price was bumped up to just over $96k before adding freight and fees. Of course you can add plenty more, with items still available including myriad alloy wheels, roof rails and cross-members, a heated windshield, illuminated treadplates and cargo sill, cargo storage rails, premium floor mats, plenty of hardwood, metal and piano black lacquered inlay options, extended leather, unique Dapple Grey wool seat and armrest upholstery developed by Danish textile supplier Kvadrat (they also supply to premium furniture brands Knoll and Vitra), Suedecloth steering wheel rim and headliner, satellite radio, dual 8.0-inch rear entertainment monitors on the backside of each front headrest with a DVD changer, and a Tow Package with a hitch receiver, fixed rear recovery eye, Advanced Tow Assist that automatically steers in order to control the position of the trailer when backing up (allowing 2,500 kilograms/5,500 lbs of trailer weight), and a surround camera system (the latter available as a standalone option as well), etcetera. Finally, $95k First Edition trim (limited to just 50 units in Canada) adds unique exterior and interior treatments to the R-Dynamic HSE P380. Knowing the Velar shares aluminum-intensive underpinnings with the Jaguar F-Pace and more so that my R-Dynamic P380 tester is dynamically similar to its British cousin’s quickest combination, titillates the senses before even setting out. After all, the fastest F-Pace S is one energetic performer with particularly athletic road manners, so it only makes sense that the identically formidable Velar should deliver the same results. On paper that’s mostly true, other than 0.2 seconds added to the more opulently attired Range Rover that sprints to 100km/h in 5.7 seconds instead of 5.5. Considering the Velar’s dramatically improved interior and greater assortment of standard features I’m just fine with that, the difference so nominal it would take some pretty sophisticated timing hardware and a side-by-side drag race to confirm, while each model’s top speed of 250 km/h is out of the question on Canada’s public roads so it’s a moot discussion, but really the more blatant differentiator is the way each SUV goes about delivering its performance. Where the F-Pace S is a rasping, growling menace to society that purposefully embraces the F-Type sport car’s track-conquering pedigree, the Velar R-Dynamic HSE P380 is an altogether quieter, more refined, more sophisticated experience. 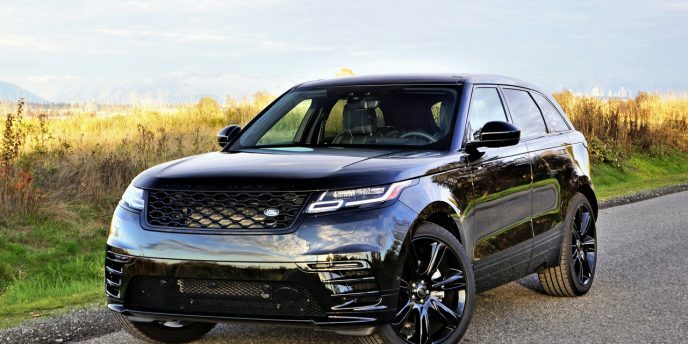 As noted by the numbers, either version of JLR’s 3.0-litre supercharged V6 gets up and goes as if shot from a catapult, 380 horsepower and 332 lb-ft of torque fed through an eight-speed automatic transmission with paddle shifters more than enough for these grand albeit still compact SUVs, but the Range Rover flies forward with an entirely new level of grace and composure. This is high-speed motoring at its best, and while I never had opportunity to test its off-road mettle I’m willing to guess the Velar is every bit the low-speed adventurer that its older, larger siblings are. Aforementioned Terrain Response lets you dial in performance settings based on any number of road/trail and weather conditions, while its available air suspension (standard with the P380) adds 46 millimetres (1.8 inches) of ride height for more extreme 4×4 situations. It’s a dream around the city too, easy to negotiate in congested traffic and nicely sized for parking, while its excellent visibility helps to see over surrounding cars. Those less interested in straight-line performance and more concerned with economy will appreciate that Land Rover employs its in-house designed and built 2.0-litre Ingenium turbo-diesel as standard equipment, good for a reasonably paced 8.9-second run to 100km/h thanks to 180 horsepower and 317 lb-ft of torque, plus a claimed 9.2 L/100km in the city, 7.8 on the highway and 8.5 combined, whereas the sportier alternative uses a still reasonable 13.0 L/100km city, 10.0 highway and 11.6 combined thanks to fuel-saving auto start/stop that shuts the engine off when it would otherwise be idling, and other efficiency systems. Speaking of efficiency, the Velar’s large compact dimensions make for five-seat comfort in all positions, while 558 litres (19.7 cubic feet) of cargo space behind the rear seats (or 673 litres/23.7 cubic feet when measuring above the cargo cover) is good for the class. Also helpful, the rear seatbacks fold in the most convenient 40/20/40 configuration, allowing longer cargo like skis down the middle with passengers in the more comfortable (and in my tester’s case, heated) window seats, while there’s up to 1,985 litres (70.1 cubic feet) of available cargo space when they’re laid completely flat via those handy optional levers noted earlier. Land Rover has thought of everything with the new Range Rover Velar, making it my choice for best compact luxury SUV in Canada. It’s suitably the priciest, but in this case it’s worth every penny. With a base price of just $43,500 plus freight and fees the 2018 Discovery Sport is Land Rover's entry-level SUV, not to mention one of the most affordable luxury sport utilities available in Canada. 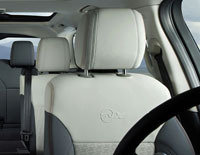 On the flip side it's the compact luxury SUV segment's most accommodating offering, thanks to a spacious interior with up to three rows of seats for a maximum of seven occupants, while all of its rivals seat just five. What's more, with 981 litres (34.6 cubic feet) of cargo capacity behind its rear seatbacks the Discovery Sport is best in class (by a long shot) for hauling gear. That second row is divided in the usual 60/40 configuration, but unlike many in this class a large centre pass-through creates a 40/20/40-split that's ideal for loading longer items like skis down the middle while those in back enjoy greater comfort from the outboard seats. Once again Land Rover has earned “Best Premium Brand” in the U.S. ALG Residual Value Awards, this 2018 recognition being the fifth of such awards bestowed on the British luxury sport utility brand. ALG is considered an industry benchmark for residual value forecasting and other types of depreciation data, in both the U.S. and Canada. Of note, last year Land Rover earned the same award for the Canadian market by taking home a Residual Value Award in every segment it competed in, 2017 being its third consecutive win. The third-party analytical firm has yet to announce its Canadian results, but Land Rover’s success in the U.S. is newsworthy just the same. As part of its 2018 Best Premium Brand win, Land Rover’s U.S. division was awarded top accolades in four separate categories including “Best Premium Compact Utility” for the Discovery Sport, “Best Premium Mid-Size Utility 2nd Row Seating” for the Range Rover Sport, “Best Premium Mid-Size Utility 3rd Row Seating” for the new Discovery, and “Best Premium Full-Size Utility” for the full-size Range Rover. This is the eleventh consecutive year for the ultra-popular Range Rover Sport to take home its award, making it an excellent bet for premium SUV buyers who want to retain as much value as possible in their new vehicle purchase after three years of ownership. The annual ALG Residual Value Awards are given to a vehicle based on its predicted ability to retain its original price after three years of purchase. Awards are meted out in 26 categories, while one mainstream volume brand (Subaru for 2018 in the U.S. and 2017 in Canada) and one premium luxury brand get overall awards too. “Land Rover continues to push the envelope with innovative new products, and design and technology that keeps the brand at the front of the pack in the competitive luxury utility space,” said Jim Nguyen, president of ALG. “Consumers have responded to Land Rover leadership with demand that continues to outpace supply, resulting in top residual values in the premium space.” ALG award winners are chosen after carefully studying all the competitors in each category, including their historical performance and industry trends. Other deciding factors include model and brand quality, production levels relative to market demand, plus pricing and marketing strategies. The mucky dirt Land Rover left all over this new Discovery SVX prototype when posing for its photo shoot says it all. This is no lily white (or Fuji/Yulong white) soft-roader, but a bold, brash 4×4 cut from the same gritty emery cloth as the legendary Defender. Most of today’s sport utilities can’t say the same. Even after the most purposefully utile off-roaders like Land Rover’s Series I staked their claim on the wild, when much more refined alternatives ushered in the SUV craze that replaced wagons and minivans as family favourites, boasting rough and rugged nameplates like Blazer, Cherokee, Trooper, 4Runner, Explorer, etcetera, with real truck-based 4×4 capability, few could really slog it out in the mud alongside anything from Land Rover. How much less so for today’s car-based SUVs, which are oftentimes little more than gussied up wagons. The Discovery was introduced back in the late ‘80s when SUVs were changing the face of the auto market. It quickly rose to prominence in the luxury sector, and has never looked back. For a bit of history, the Discovery Series I was replaced by the slightly roomier and more refined 1998-2005 Discovery II, while the much improved 2003-2009 Series III was renamed LR3 in North America when introduced for the 2005 model year, before the 2010-2016 LR4 brought Land Rover’s most family friendly model fully into the premium class both stylistically and luxuriantly. The new 2017 Discovery, which remains mostly unchanged as it moves into the 2018 model year, other than some minor yet important updates including standard autonomous emergency braking, standard InControl Touch Pro Navigation now benefiting from a larger 10-inch touchscreen, the turbo-diesel powertrain now available throughout the entire model lineup, and a revised second-gen head-up display system that can now be had on HSE and HSE Luxury trims, is a completely reimagined sport utility that eschews nearly everything from its LR4, LR3 and Discovery past. Most obviously its blocky corners have been wholly smoothed over, but more so that metalwork is now formed from aluminum instead of steel, while an even more significant change sees the old Integrated Body Frame (IBF) platform architecture left behind for a monocoque body shell. The suspension is aluminum as well, the result of these lightweight materials being a 480-kilogram (1,058-lb) reduction in curb weight from the outgoing model, for much improved driving dynamics and efficiency. While this strict alloy diet should theoretically aid off-road capability, some naysayers point to the change from partial body-on-frame architecture to monocoque (a.k.a. 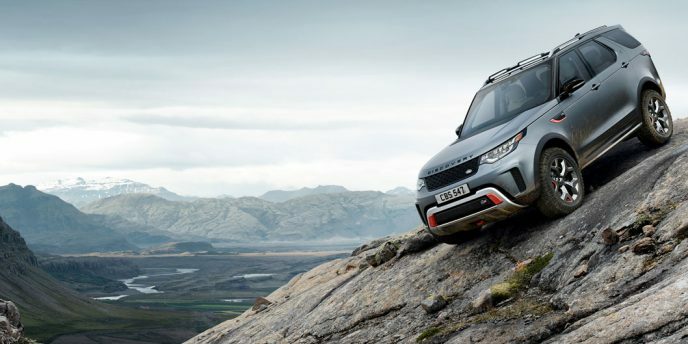 unibody) as a negative when the pavement ends and trail begins, which makes it all the more important for Land Rover to highlight that its new Disco is every bit as capable off-road as its outgoing LR4. What better way to prove this point than to showcase a special off-road optimized version of the new SUV, that every diehard Land Rover 4×4 fan will want to call their own. Meet the new Discovery SVX, just revealed at the Frankfurt motor show. It’s a “production preview” of what the British SUV brand is calling “the ultimate all-terrain Land Rover Discovery.” Just one look should have even the most jaded 4×4 purists wanting a turn at the wheel, plus news that behind its matte grey, black, silver and orange coloured front fascia is Land Rover’s 518 horsepower supercharged 5.0-litre V8. Aiding both off-road performance and on-pavement stability is new Hydraulic Active Roll Control (H-ARC). This SVX-exclusive technology allows for increased wheel articulation when tackling aggressively uneven trail surfaces, plus reduced body-roll during fast-paced cornering. An additional Land Rover first is the Discovery SVX’s specially tuned Terrain Response 2 four-wheel drive system, which, along with manually or automatically modulating throttle, brake, and torque distribution from a dial atop the centre console, includes active centre and electronic rear locking differentials for optimizing traction in all weather conditions and all types of surfaces. Likewise, the model’s eight-speed automatic gearbox and twin-speed transfer case have been tweaked with “unique software calibrations,” says Land Rover, while variable ratio electric power-assisted steering (EPAS) joins the Discovery’s usual assortment of advanced driver assist systems, including Hill Descent Control, Electronic Traction Control (ETC), Adaptive Dynamics, Dynamic Stability Control (DSC), and All-Terrain Progress Control (ATPC). 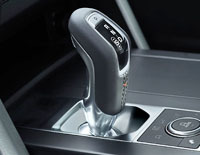 Providing “optimum control of gear selection in off-road manoeuvres,” the current production Discovery’s Drive Select rotating gear selector has been replaced by a Pistol Shifter that looks as if it was pulled straight out of a Jaguar F-Type, other than the tiny orange cross-stitched “X” that’s applied overtop the leather shift knob’s regular French stitching and some minor changes to the lever’s backside design, this JLR parts bin-sourced item making perfect sense for an SUV that’s bound for production. Yes, something very similar is on the way next year, with Land Rover confirming the “Discovery SVX will be the first Land Rover assembled by hand at the SVO Technical Centre when production begins in 2018.” What might change ahead of production? True 4×4 aficionados would most likely rather have the fuel-friendly and therefore much more range-capable turbo-diesel in place of the hyper-tuned V8, the formidable powerplant’s 461 lb-ft of torque tempting yet more in tune with off-road racing than any serious, adventurous safari-like 4x4ing. In stock trim the 3.0-litre turbo-diesel V6 is good for 254 horsepower at 3,750 rpm and a still impressive 443 lb-ft of torque at 1,750 to 2,250 rpm, while fuel economy is rated at 11.2 L/100km in the city, 9.0 on the highway and 10.2 combined, which won’t only save weekend warriors a lot of coin on the way to their trails of choice, but get them much deeper into the wilderness per tank of fuel. If you’re wondering where the SVX nomenclature hails from, JLR’s aforementioned SVO (Special Vehicle Operations) division is fully responsible. It also produces the highly acclaimed Range Rover Sport SVR and new Range Rover SVAutobiography (SVA), the former representing the ultimate in SUV performance, the latter being the ultimate in SUV luxury. 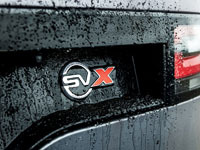 SVX, of course, is for those wanting the ultimate in off-road capability. As for styling, this SVX production preview certainly looks the part. 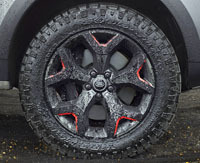 The front and rear bumpers are unique, featuring protective skid plates and exposed Rush Orange-painted recovery eyes that Land Rover says can manage more than 6,000 tonnes (6,614 lbs) of SUV and gear, if the need to get unstuck via a two vehicle or winch arises (never do any serious 4x4ing without a handheld come-a-long). An electric winch is mounted within the rear bumper, its orange hook hanging from the left rear recovery eye in the photos. 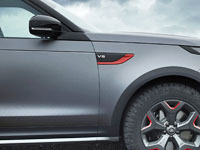 Land Rover calls the matte-finish exterior paint Tectonic Grey, which is as much of a dark silver as a light grey. While attractive, this surface treatment also provides an anti-glare finish for the hood, helpful for reducing strain in the eyes when trying to keep a lookout for obstacles ahead. Additional unique details include a Narvik Black Dynamic grille, Narvik Black side vents with V8 badging, silver roof rails, and a roof-mounted light bar up front featuring two rows of LED driving lights for help in low-visibility situations. Inside, the SVX gets a combination of Lunar and Light Oyster greys with more Rush Orange accents, the little “X” on the shift lever complemented by more X logos on the SVX-branded seats. “SVO designers are embedded within the Land Rover team and have worked with our engineers to unleash their own passion for adventure to create another truly desirable and versatile vehicle in the Land Rover line-up,” said John Edwards, Special Vehicle Operations Managing Director. Longtime Discovery fans will likely find the SVX’ orange highlights familiar, the colour previously used as the livery for G4 Challenge events, plus the race replica production models that soon followed. Land Rover’s Camel Trophy branded Discovery and Range Rover models wore more yellowish-orange paintwork, which will no doubt make a comeback at a later date when yellow comes back in popular favour. Now, the SVX’ grey and orange colour scheme is the height of fashion.